A surprise rejection is a major setback for both partners, but not the end of the line. Akcea Therapeutics, Inc. (NASDAQ:AKCA) and Ionis Pharmaceuticals, Inc. (NASDAQ:IONS) recently announced a rejection that caught the market off guard. The companies didn't have much to say, but we can run down some clues that help explain the FDA's surprising decision. The FDA issued the partners a complete response letter (CRL) regarding an application for a rare-disease drug called Waylivra, and they're being awfully tight-lipped about it. Even though these letters aren't subject to full disclosure, companies are usually quick to point out minor details that need to be addressed before submitting again. Since Akcea and Ionis haven't offered any details, minor or otherwise, the problem probably won't be an easy fix. If I had to guess, I'd say the partners failed to satisfy safety concerns. During a study underpinning Waylivra's application, some patients receiving the experimental therapy exhibited disturbing platelet reductions. Ionis and Akcea developed Waylivra for people with out-of-control blood triglyceride levels that can lead to fatal bouts of pancreatitis. Despite the risk of uncontrolled bleeding, an independent advisory committee voted 12-to-8 in favor of approval because the drug effectively lowers triglycerides, which should lead to less organ damage over time. Rapid loss of platelets and other vital blood components isn't unusual among temporary cancer treatments, but ahead of the advisory committee meeting, FDA reviewers didn't seem convinced that any risk-mitigation plan would be sufficient for a lifelong therapy. Perhaps Akcea exacerbated the situation by attempting to gain approval for a dosing regimen and platelet monitoring strategy that it hadn't evaluated in trials. The partners' lack of comment probably means Waylivra's on a slow ride to nowhere, although a pivotal study with patients affected by another inherited lipid disorder is ongoing. Familial partial lipodystrophy results could breathe new life into this program next year, but investors should probably start looking toward the company's late-stage pipeline. Inotersen's next in line, and it's already earned approval in the EU to be marketed as Tegsedi for the treatment of transthyretin amyloidosis-related nerve damage, or ATTR polyneuropathy. Unfortunately, platelet drops were a key safety issue for this drug, too, and that has investors feeling nervous about an FDA approval decision expected in October. If approved, Tegsedi will run directly into competition with Alnylam's (NASDAQ:ALNY) recently approved treatment for the limited population of ATTR patients, Onpattro. Inotersen and Onpattro haven't been tested in a head-to-head study, but most analysts expect Alnylam's drug to gain a much larger share of the limited space than Akcea's. Akcea finished June with $382 million in cash and equivalents after burning through $92 million during the first half of the year. That should be enough to see the company through 2019, but without any contribution from Waylivra the company will probably need to raise capital before one of three candidates in mid-stage trials right now has a chance to contribute any revenue. Ionis still has a 75% stake in Akcea, but Waylivra's CRL is more of a speed bump than a roadblock for the RNA antisense pioneer. Investors probably don't need to worry about potential partners avoiding Ionis because of Waylivra's mishap. Spinraza, an Ionis drug that Biogen (NASDAQ:BIIB) launched at the end of 2016, hit an annualized $1.7 billion run rate in the second quarter. Spinraza royalties made up 37% of total revenue in the first half and could be responsible for a majority of Ionis' top line by the end of the year. Unfortunately, an experimental gene therapy under development by Novartis might derail the Spinraza gravy train, which would leave Ionis far more reliant on success from some big discovery deals the biotech signed recently. Earlier this year, Biogen handed Ionis $1 billion upfront to expand a discovery deal through a new 10-year term. In a nutshell, Biogen tells Ionis it wants to alter the expression of a specific gene and Ionis delivers a drug candidate. If something they throw at the wall sticks, Ionis could find itself in line for lots more milestone and royalty revenue down the road. Despite recording $262 million in total revenue during the first half of the year, Ionis reported a $42 million loss during the period. Preparing for a U.S. Waylivra launch tipped the scales negative, but now that the launch has been postponed indefinitely, the company might produce a slight profit in the second half. Shares of Ionis and Akcea tumbled following the surprising news, but neither stock has fallen far enough to look like an attractive buy right now. 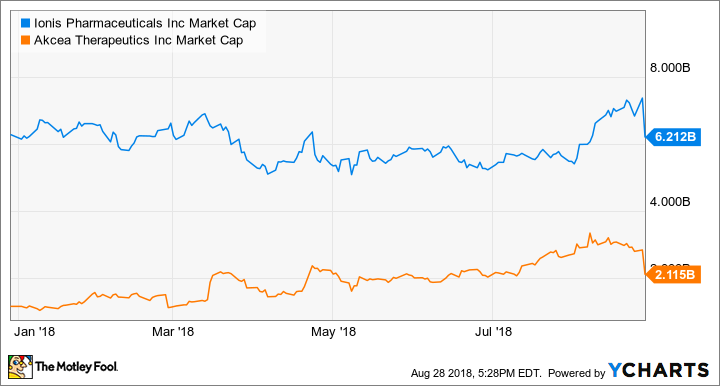 Ionis could outperform for investors without Waylivra in the years ahead, but Spinraza needs to continue unimpeded for a lot longer than we can safely depend on to justify the company's $6.2 billion market cap at recent prices. Akcea took a far worse beating than its parent, but it still hasn't fallen far enough to look like a real bargain. If the FDA takes an equally dim view of Tegsedi, the stock could tank again.